We provide tailored advice and services to assist our clients to successfully prepare and plan for all of their bookkeeping, accounting and taxation needs. Leave the accounting to us, so you can lead your life to its fullest. 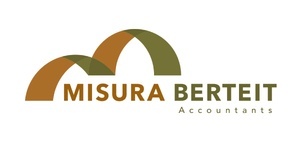 Committed to your overall financial health, Misura Berteit will work with you throughout the year to ensure that your accounting needs are met. We operate in corporate tax and related financials, review and audits, bookkeeping services, and personal tax. Consider hiring us as your virtual C.F.O. – meeting your accounting needs while saving you thousands of dollars in staffing. Our unique Virtual CFO product offering allows us to assess your business and offer recommendations and solutions to potential tax problems, cash flow and profit issues, while maintaining a focus on overall improvement in your financial performance. This is done by or partners and is the highest level of accounting and support. Our bookkeeping clients receive a leg up on their monthly routine, with our newly introduced “Tax Buddy” filing system. Quarterly or Monthly file system that separates your bookkeeping slips to save you money and us time. Win WIN! !